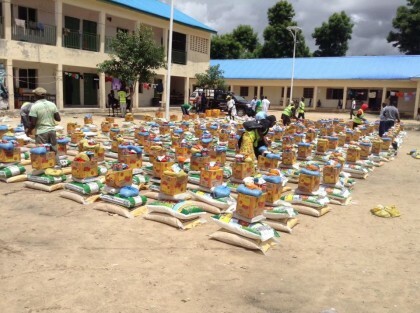 Sani Datti, Maiduguri: A total of 55, 950 bags of rice, 30, 214 bags of maize and others assorted food and non food items were handed over to the Borno State Government by the National Emergency Management Agency (NEMA) for distribution to various Internally Displaced Persons (IDP) camps in Maiduguri between February and July this year. Also supplied to the state government within the period were 10, 400 bags of beans, 10, 135 bags of sugar, 100 bags of millet, 1, 200 bags of maize grits, 2,100 cartons of tomato paste, 2, 100 cartons of Maggi cubes, 1,500 bags of salt, 180 bags of flour, 2400 jerry cans of vegetable oil and 2,400 jerry cans of palm oil. These items, were supplied by the Federal Government through NEMA in fulfilment of an existing MoU with the state government. The last tranches delivery of relief items to the state government was on Tuesday 12/7/2016 when the North east zonal coordinator of NEMA, Mohammed Kanar, handed over 8, 000 bags of rice, 3200 bags of beans, 1000 bags of millet and 1, 200 bags of maize to the Borno State Emergency Management Agency. The next delivery is this week, once the supplies are completed. 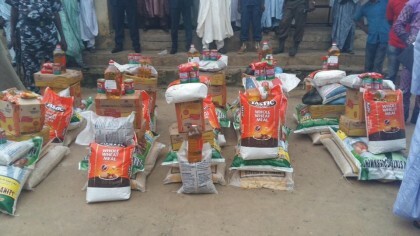 This month (August), the agency delivered additional 3,100 bags of rice, 3000 bags of beans, 1850 bags of Guinea corn, 650 bags of millet and 1200 bags of rice (50kg) in the few days based on request from the state government to augment the regular supplies which were presented to the SEMA Chairman, Ahmed Satomi, and Chairman Monitoring/ Distribution of Relief Items to IDPs in Borno state, Alhaji Mohammed Sani. 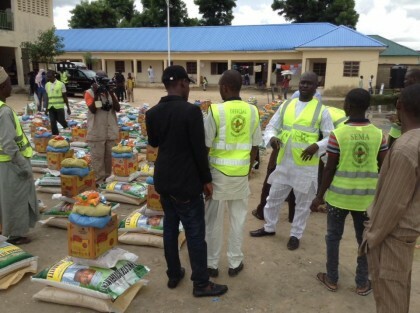 Similarly, NEMA has delivered relief materials directly to the IDPs in the satellite camps and IDPs camps in Maiduguri, comprising of 4, 367 bags of rice, 1, 330 bags of beans; 1, 508 bags of millet, 2, 600 jerry cans of vegetable oil, 100 jerry cans of palm oil, 46 cartons of milo beverage, 150 cartons of tomato paste and 1, 850 pieces of nylon mats from March to July. Others were 850 pieces of mattress, 1, 140 cartons of macaroni noodles, 5, 150 pieces of blankets, 900 pieces of mosquito nets, 1, 358 bags of guinea corn, 100 bags of maize, 390 cartons of “Garin danwake”, 239 cartons of powdered milk, 1, 600 pieces of guinea brocade, 2, 115 Wax prints, 180 Cartons of toilet soap, 100 cartons of detergents, 200 pieces of plastic cups, 350 pieces of plastic plates, 1, 900 pieces of plastic buckets and 640 packets of zinc nails. In addition to the humanitarian intervention in Borno State, the agency has also been unwavering in its commitment to the provision of supports to IDPs in Yobe, Adamawa states and other locations across the country. The MoU stipulate amongst others that NEMA supplies raw food to IDPs while the Borno state government provides additional condiments and maintains the camp environment. There are 113, 398 IDPs living in 13 camps in Maiduguri town and its environs. The satellite camps have 306, 380 IDPs located in 16 liberated communities and towns. A part of coordination role, the agency has been collaborating with other organizations in carrying out medical outreaches to the IDPs in the camps as well as providing medical consumables for camp clinics and referral hospital within Maiduguri. 2016/2017 NIGERIA CUSTOM AUCTION SERVICE ; WE SELL ALL KIND OF TOKUNBO CLEAN CARS,BAGS OF RICE=N6,500 AND BAGS OF CEMENT=N1,000 AT CHEAPER AND AFFORDABLE PRICE INTERESTED BUYER SHOUlD PLEASE CONTACT *CUSTOM BELLO IBRAHIM * ON (08145036311) FOR CLEARANCE, DELIVERING, RECRUITMENT AND REPLACEMENT FORM IS OUT FOR #14,250 :SOME OF THE CARS LISTED ARE Golf2.3 & 4 N250,000.